The US Department of Justice announced an additional charge for detained Russian national Mariia Butina on Tuesday, one day after she was accused of conspiring to act as a foreign agent. The US government announced on Monday that Butina, 29, had been indicted for conspiring to act as a foreign agent for Moscow. With the latest additional alleged crime, Butina is seen by US authorities as having materially acted as a foreign agent in addition to conspiring to be one. A grand jury indicted the individual on Tuesday on the second charge. The indictment was filed in a Washington DC federal court, Bloomberg reported. 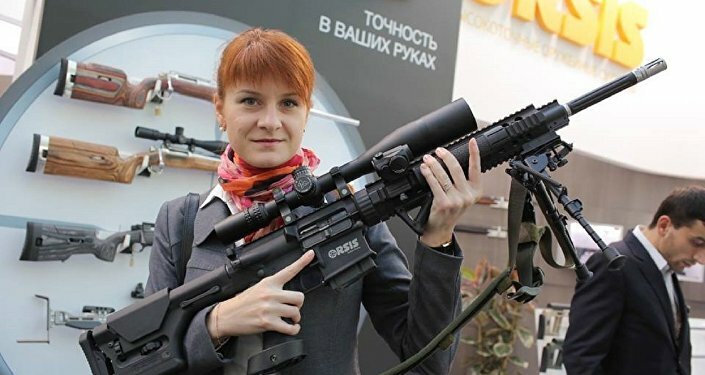 "Between in or around January 2015 and up to and including the present, in the District of Columbia and elsewhere, defendant Mariia Butina, also known as 'Maria Butina,' did act within the United States as an agent of a foreign government," the new indictment said. Shortly before the latest announcement, the Russian Embassy in the US called on authorities to allow consular access to Butina. "As the materials of the court case are classified, the interests of this woman of Russia illustrate her need for a qualified lawyer," the embassy said, promising to "defend" Butina. "Ms. Butina has been cooperating with various government entities for months regarding public allegations related to her contacts with various American and Russian individuals. Months ago, she voluntarily and privately testified before the bipartisan United States Senate Select Intelligence Committee on Intelligence for 8 hours and produced tens of thousands of documents," Robert Driscoll, an attorney representating Butina, told Sputnik News on Monday. The statements listed in the DOJ's complaint on Monday are "overblown," the attorney noted. US Rep. Dana Rohrabacher (R-CA) dismissed the allegations against Butina as "bogus," "ridiculous," and "stupid." "It's ridiculous. It's stupid," the congressman told Politico Tuesday. "She's the assistant of some guy who is the head of the bank and is a member of their Parliament. That's what we call a spy? That shows you how bogus this whole thing is… This is an attempt to undermine the president's ability to have better relations with Russia."